What to talk about after so long an absence?!?! I've had so many wonderful experiences and opportunities recently, and so I can't wait to tell you the stories of my travel to support women's conferences in Albania and Macedonia. 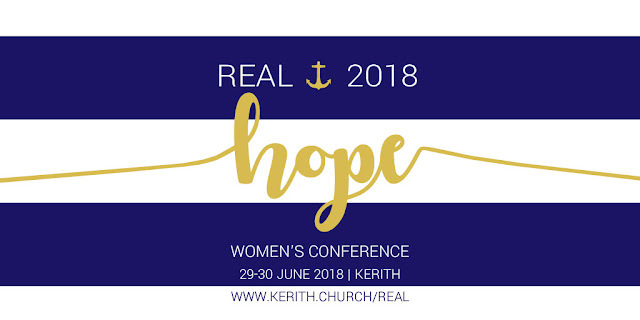 God was so good to us, and it was such a privilege to travel there with our wonderful Kerith women, to pray for the Balkan women and to stand alongside them as their sisters, encouraging them in their faith. We gave away what we had in terms of our faith and trust in God. We know that we received so much from being there. There are so many great stories and reflections from the teams that I'd love to share, and so I'm looking forward to including them in future posts. For now, the big news is that REAL is coming soon!!!! I can't wait for us to gather together - the theme is HOPE, and wow I know that God's going to speak to us, be with us, strengthen and bless us as we prioritise that time to be with Him. The worship will be amazing. The teaching will be amazing, with 5 local pastors with hearts that love God and His Word, and love you, His women; and fresh for this year, our interactive and relevant Seminars. The snacks will be amazing. Come for community, come for God, come with open hands and expectation - you won't be disappointed. And....the town centre is finally complete!